Gov. Bruce Rauner after his first address as governor in 2015. Rauner urged bipartisan action in his “State of the State” address on Wednesday. Gov. 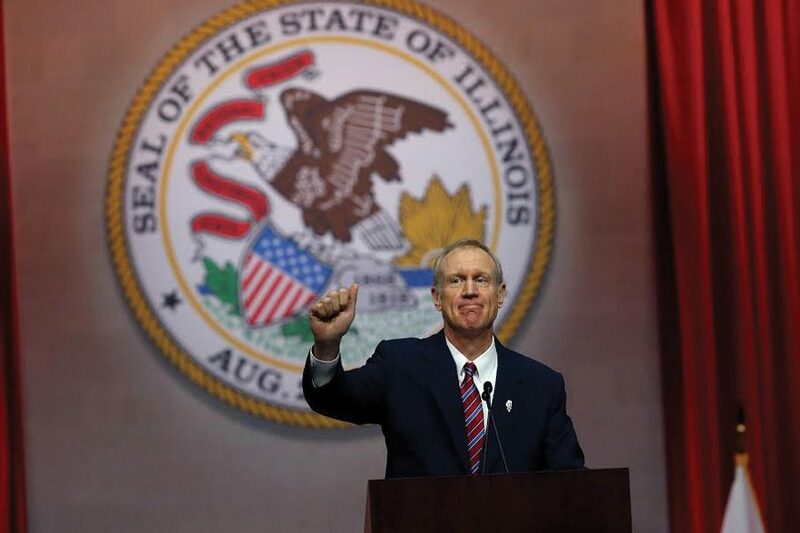 Bruce Rauner said he remains optimistic about the future of Illinois, but acknowledged various issues that plague the state in his third State of the State address Wednesday. Speaking in Springfield, Rauner highlighted the bipartisan efforts of the past two years that he said have led to improvements in areas ranging from ethics reform to government transparency to transportation. Illinois still does not have a budget for 2017, however, and has not had a full-year operating budget for 19 months, which the Republican governor said continues to hurt the state and its schools, human service providers, workers and employers. Rauner said leaders from both political parties agree on the need to reach a budget deal and praised state senators and leaders for their work on trying to reach a budget deal. “Our state’s economy could take off like a rocketship if we could just come together on major pro-jobs changes that need legislation to take effect,” he said. Rauner urged lawmakers, as he did in his 2016 address, to support term limits and redistricting reform. Rauner brought up the Illinois Supreme Court’s decision last August to strike down a proposal to place a redistricting amendment on state ballots in November. The amendment would have given the power of redrawing state legislative districts to an independent commission. “I ask you today, on behalf of all the people of Illinois – Democrats and Republicans – please do the right thing and pass the bills to put term limits and fair maps on the ballot,” Rauner said. A bipartisan task force that will recommend ways to improve funding for all K-12 schools is expected to finish its work in the upcoming weeks, Rauner said. He said it is important that the state and Chicago Public Schools treat children of all socioeconomic levels the same in education and provide vocational opportunities in schools. “For years, Illinois has provided the lowest percentage of education financial support from any state in the country, and we have the largest gap between funding for high-income schools and low-income schools in the country, both across the state and within the city of Chicago,” Rauner said. In addition, Rauner said the state must continue to support its “world-class research universities” that create jobs and foster innovation. State Rep. Lou Lang (D-Skokie), deputy majority leader in the Illinois House of Representatives, delivered the Democratic response to Rauner’s address. Lang said in a video address that Democrats agree with Rauner and the Republicans on the need for a budget deal and on improving the state business climate. However, Rauner’s ideas involve stripping away rights and protections for workers and harm vulnerable citizens, Lang said. State Sen. Daniel Biss (D-Evanston) echoed similar sentiments, saying in a statement Illinois has “undergone a crisis” during Rauner’s term. Rauner said that lawmakers and leaders from both parties in Illinois have a “moral obligation” to work together. A budget deal is necessary, he said. “We together can return Illinois to a place of hope, opportunity and prosperity,” Rauner said.